OnePlus has already started talking about its next smartphone, the OnePlus 5. It's teased some possible color versions, and the CEO revealed what chipset will be powering it. As we inevitably get closer and closer to its unveiling, the company seems intent on focusing just on the OnePlus 5. So it's decided to retire the OnePlus 3T. There are apparently only a few units still available for purchase, so if you want a 3T you should grab one as soon as possible. OnePlus says "this is the last call" to buy the 3T "before stock runs out". When that happens, it's all over for what was one of 2016's best received reasonably priced smartphones. If you're worried about future software updates, the company says that's not warranted. It promises to "continue to bring more software updates and support to the OnePlus 3 and 3T". That said, such promises are a dime a dozen in the mobile world, and unfortunately they get broken all the time. 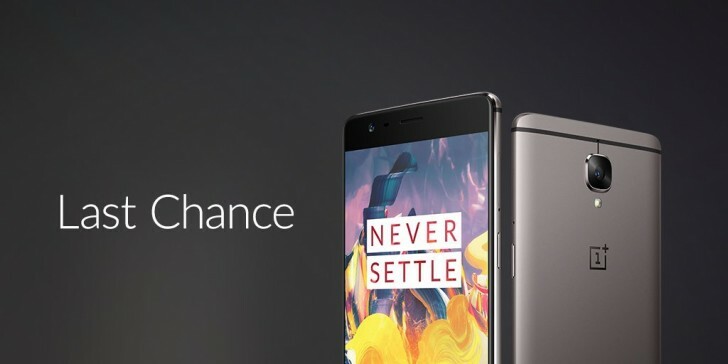 Hopefully that won't be the case for OnePlus' 2016 lineup. I love my minight black 3T and I can't imagine parting ways with it anytime soon. But then again.. the OP5 will probably be amazing all over again lol.